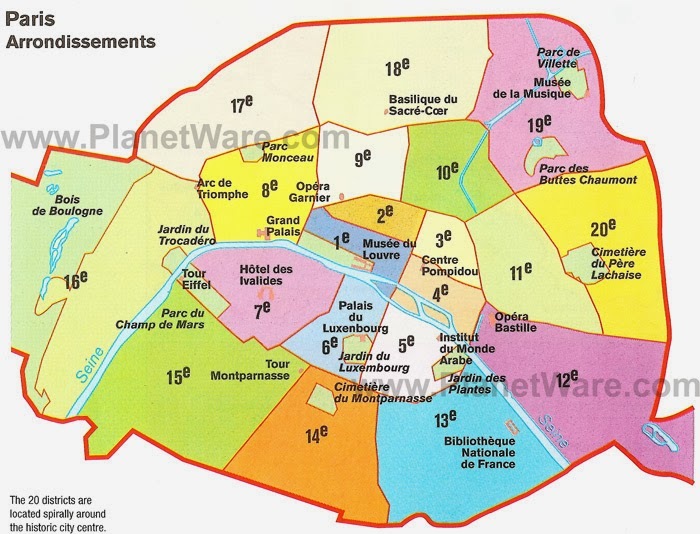 A medieval wall built under King Philippe Auguste in the 12th century used to delineate inside Paris and outside (outside being everything including where you now find the Luxembourg gardens and of course the way, way far off countryside of Montmartre where Sacré Coeur is located). A small part of that wall still stands in the Marais, just a few minutes walk from where I live in the heart of the city. Nowadays, when you're on the "outside" of that wall, you're still in the heart of Paris. While only a small fragment of that wall remains, there are two modern walls that surround the city: one the peripherique that rings the city, and another invisible wall inside the city that roughly surrounds the 1st-11th arrondissements (and you can throw in much of the 16th for good measure) and sets off "inner" Paris, which is older and richer, from "outer" Paris, which has more modern architecture, more recent immigrants, and lower income levels. It's the same divide you have in any city, and based on your own city, you can pretty much tell where the tourists go, where the schools are better, where the stores and real estate are more expensive, which neighborhoods are for the hipsters, where the artists live, etc. On the edge of the 5th, going into the 13th, there's even a sign officially telling you "You are leaving the tourist zone." Well, by the looks of the square, modern concrete buildings, all with Chinese writing, I guess I could have figured that out myself. and of course I see the Tour Montparnasse, not only from the gym area but even from our own balcony. This is the sort of cheese you might be served on your next flight into or out of Paris. We've had the pleasure, and now it's your turn. It's a processed, industrial, mass-produced cow's milk cheese that is softer and silkier than American cream cheese. It's somewhere between a whipped cream cheese and a mousse. Gigi loves it, and the row behind us on the flight hands their packages over to her. Though it doesn't taste horrible and, in fact, is about 10 rankings higher on the quality scale than the stale rolls we are served on the same flight, being served this cheese in French airspace feels rather like being served Manischewitz in Napa Valley. Or La Choy canned chop suey in Beijing. This, too, is Paris. And this, too, is French cheese. I guess.